On March 3, an action was held at Polomarket heaquarters in Giebnia, to discuss the demands of former and present workers at the market who have organized to improve working conditions and rectify the situation of several former employees. A few weeks ago, workers presented a long list of problems in the supermarket chain, including problems with working hours (having to work on days off, unpaid overtime, incorrect documentation, forcing people with disabilities to work more hours than they should, problems with taking guaranteed breaks and several health and safety issues). A work inspection confirmed most of the important claims. Despite the fact that we possess the protocols and quoted them several times, Polomarket keeps claiming in the media that the inspectors DIDN'T find any problems, which is not true. In addition, they have made various threats related to this and have initiated a lawsuit against R., one of the workers concerned. 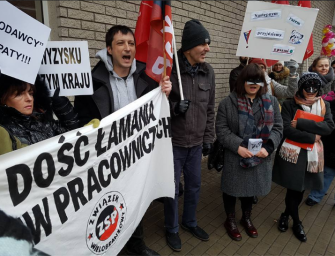 Upon announcing that the workers would take action, a series of pickets was held in Bydgoszcz, where the problems occured, in the middle of February. The protests met with various attempts at intimidating workers, who were warned not to talk to us, etc. The company complained to Facebook about the event we posted about the protests and it was removed. The protests were invigilated by a number of spies who followed the workers to different actions, menacing and filming them. Journalists were warned against taking photos that clearly show the name of the supermarket and its logo. It seems that Polomarket has chosen to deal with these problems by denial and harrassment instead of dialogue with the workers. Despite all that they did to try and frighten the workers, they publically claimed that „nobody contacted them” and they were waiting for a chance to negotiate with the workers. 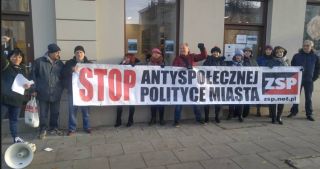 On February 18, a group of current and former employees of POLOMarket protested at three locations in Bydgoszcz. Recently workers in that city organized themselves in order to improve both the working conditions in the POLOMarket chain and, they hope, inspire other workers to organize in their workplaces. Among the problems the workers wish to address are practices which ZSP has encountered in other supermarkets as well: forced overtime work which is not recorded or paid, making people with disabilities work above the legal limits, forcing people to work without breaks and various health and safety violations, including not providing training on some equipment such as forklifts. Currently the Prosecutor is also checking whether there are fake signatures on some time sheets: workers claim that there were falsified documents. Some other violations relate to health concerns since workers were forced to take expired meat home and grind it up to bring back to sell. In addition, the workers disagree with how one woman was fired and consider it to be an unfair dismissal. The former workers have claims against the market, including unpaid overtime and the current workers would like the aforementioned practices to be stopped. As more workers join in, a more complete list of demands will be sent to the market. POLOMarket has already shown a strong reaction to news of the union and the planned protests. Workers received instructions not to speak to or contact us, which only meant that more people found out about it and started to write to the union. Lawyers for the chain have sent threatening letters to ZSP and managed to get Facebook to remove the protest event. As we understand, journalists were also warned by the market, who falsely claims that the workers' complaints have not been confirmed. Finally, several spies were sent to the protests to film the workers and try to intimidate them. The workers plan to continue their organizing efforts in the market and new actions will be held in a few weeks. On January 22 we organized a protest at Miau Cafe in Warsaw. Miau Cafe hired staff to work and never gave them work contracts: the women who worked there did not have payments for social security, vacation or sick leave and were made to work overtime. They finally gave notice due to the negligence of the owner to provide legal working conditions. The workers decided that they would like to protest in order to highlight the problems in the hospitality sector, where some of them still work or planned to be employed in the future. The owner of the cafe, in response to articles about the situation, tried to blame the girls as being "bad workers" and falsely claimed that she had given them contracts. We are calculating how much they are owed for unpaid overtime and lost benefits and demand that these are paid. Protests should continue until the owner regulates what is owed. Moreover, anybody who she employs in the future should have a proper work contract. The cafe had initially gained a lot of financial support from cat lovers because the cafe has a few cats living there. Exploiting people's love of cats to make more money, the owner reacted to the scandal by posting stories of an epilectic cat and other cat charity actions in order to try to gain sympathy as a saviour of cats. Today however, protestors saw a very angry and violent woman, who tried to grab the microphone from one comrade and whose friends started violent incidents, both at the protest and afterwards, when they tried to ambush a group of people leaving. Luckily nobody got provoked by the owner or her friends, who gave to support the person who denied workers their basic rights in order to put more money in her pocket. People who came to support the protest said that they would be back and will keep up the protest until the demands are met. Due to the fact that things are going worse and worse in the Polish Post, we are forced to take concrete action. On January 14, an initiative group, Mail Carriers Wroclaw, met and decided to coordinate actions between the different post offices. We plan different types of actions and we intend to fight until we win, using any means necessary. We invite all employees of the Polish Post from the whole country to fight and create a horizontal, non-bureaucratic, non-party structure. We will inform you of future concrete actions. 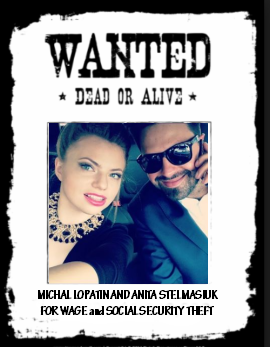 A few dozen workers from a call center in Warsaw are on the lookout for Michal Lopatin (and his wife Anita Stelmasiuk). PL Outsourcing, the company run by Lopatin, had been behind on paying some employees starting at the beginning of 2016. By the summer, the firm stopped making payments. Lopatin and his wife (from whose account many were paid) took off, leaving the workers without any salary, and went off to live in Santa Monica, California. Workers are trying to get what they are owed and ask for the help of their fellow workers in the US to help track this deadbeat boss down. The call center was one of many fly-by-night operations set up by young entrepeneurs in Poland to make a quick buck. Such operations often look like decent startups to workers desperate to get any job. They usually make big promises to employees, but close down after some while, often leaving people without their wages. The 31-year old Lopatin has already been involved in owning/running three similar enterpresises: PL Outsourcing, Perfect Outsourcing and Kings of Sales. Technically, PL Outsourcing and Perfect Outsourcing are two separate legal entities, but they were in fact the same, run by the same people, in the same place. Such legal manouevres are often used by business people to transfer workers betweeen legal entities, to avoid legal obligations. People who were employed at PL Outsourcing were often promised that they would be employed after a three-month trial period. But usually workers were instead put on civil contracts. As „contractors” instead of employees, the workers did not receive holiday pay, sick leave or other benefits due to them. However, the actual work down should have been recognized as an employment contract. Other problems came up due to the fact that the workers later found out that Social Security payments had not been made for them. In addition, neither were payments into the guarantee fund. The boss skipped town, leaving people without the work certificates needed to claim unemployment benefits and without any possibility to claim emergency aid to workers from banrupted companies. Lopatin, in fact, did not announce the company's bankruptcy. In Poland, the technical state of bankrupticy occurs when you cannot pay your debts, including debts to workers. Failure to fulfill the legal procedures at this point is an economic crime. Luckily for Lopatin, his wife Anita won the green card lottery and the couple packed their bags and settled into a new life in Santa Monica. One can read about how wonderful life is for the pair, among other places, on Anita's blog. www.waytousa.pl While the self-styled „enterpreneurs” have been enjoying vacations to Italy, or sun and the beach in their new homes, the former employees of the call center and still struggling to get out of the debt incurred when Lopatin packed up and fled. Maybe Michal and Anita think that nobody is going to be able to get their money all the way over in California and that the people who got screwed will just write off their losses. After all, it is very hard to get them over there. Hard, but not impossible. It is also clear that not being here, any and all legal action taken against them will work to the workers' benefit. Lopatin nowadays is somehow connected to landscaping. It is not clear whether he has decided to actually do some hard work himself, or whether he still has entrepeneurial ambitions and intends to get other people to work for him. He is listed as working out of 12920 West Magnolia Boulevard in Sherman Oaks. In order to attempt to get their money back, the couple needs to be located. All information would be appreciated. In the meanwhile, wage theft continues to be a serious problem in this country. ZSP, a base union, has been the only organization where workers have been able to effectively recover money owed. Sometimes this is possible by taking direct action. Direct action means, among other things, that we won't stay silent about incidents like this. Don't let yourselves be cheated by the bosses! Organize and take action! Solidarity is our weapon! Last month we wrote about money workers left high and dry by MarcPol supermarkets received after an action where they blocked the entrance the market in downtown Warsaw. All of the workers who took part in the action actually received money - more than 100,000 zloties in total. Unfortunately, not all workers owed money have received any yet. This shows, once again, that those that choose to take action are more likely to get something that does that don't. We still hope that the others will at least get some payment from a special fund that deals with these things, but it has been almost six months already. The schemes set up by the state that are meant to "protect workers" are doing a lousy job. First of all, they do not guarantee compensation in the total amount of their wages and second of all, they take their time. The court tends to appoint people who get paid whether or not they do their jobs in helping workers to recover money. With this experience in mind, ZSP calls on workers to organize themselves and to stop taking such abuse! When the organized take action, they are more likely to achieve results! 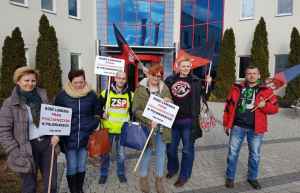 Over the last few months, our comrades from ZSP working in the Post Office have been coordinating with other workers around Poland, outside the mainstream unions. A number of protests have taken place in different cities in Poland which have included pickets, sick-in strike actions, go-slows, banner drops and direct action on the job. 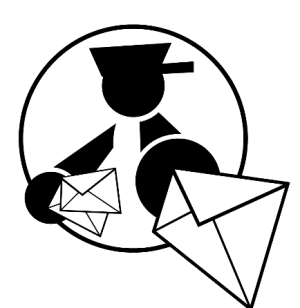 The MailCarrier.pl Network and in particular, the organizations in Czestochowa, Poznan and Gdansk have sent demands again to the Post Office. Among the demands are wage increases and actions against the practices of staff cuts and creating a "grey area" of workers in the PO. They also demand the dismissal of the Network Director in Warsaw who scandalously tried to repress those who planned protest and strike actions in Warsaw. The ZSP, which includes postal workers in a few cities, is active in supporting the development of the network and expresses its contempt at the Director who is spying on and threatening workers. Warsaw ZSP is coordinating a response. The ZSP continues to act in the Tenants Defense Committee (and Tenants Action in Wroclaw) against the attacks on the the ill, retired and unemployed and the low-earning working class who live in public housing, carried out by those who want to commercialize housing, privatize it and gentrify neighbourhoods. The last few months saw and increase in activity has corruption scandals rocked the country. The Committee has been exposing the criminal actions of a privatization mafia which involves public officials, lawyers, real estate speculators, prosecutors and judges for years. However, politicians denied these facts and for years tried to portray this all as the rantings of radicals. However, the media finally published irrefutable proof supporting our claims and the privatization mafia has become well-established in the public record (despite the fact that many of those involved have slipped through the cracks and have managed to keep their positions). Members of ZSP would like to briefly reply to the smear campaign waged by a marginal anarchist zine entitled „Amor y Rabia” and the magazine "Prisma" published by the Amor y Rabia group from Valladolid. * Outrageously, Amor y Rabia usurps the right to write about matters claiming to express the „perception of the CNT”, without being any mandated organ of that Federation. The article being spread (among other places on the ALB forum in Spain) is an attack on the IWA, but in particular, contains lies, aimed against the workers of our Federation and our region. The manipulative „Amor y Rabia” labels our Federation (ZSP) a „miniscule organization” claiming we are many times fewer than we are in reality. In fact, this media de manipulation singles out the unions of Eastern Europe as examples of „pseudounions”, each time lowering their actual membership to support their narrative. Other member Sections of the IWA are not singled out or criticized, despite the fact that they are all smaller than we. Not that we care to be dragged into such stupid games and compare ourselves to others, but it is clear that the false information is aimed at particularly our union and comrades from Eastern Europe. In our opinion, this shows an intense prejudice towards workers from our region, one unfortunately displayed on more than one occasion. That such prejudices appear in such a manner is a clear assault to the principles of internationalism and mimic the tactics of nationalists and labor protectionists.